Craft Markets, the growing phenomena of our modern troubled economic times, have sprung up like mushrooms, giving the entrepreneurial-hearted a chance to supplement incomes, or eek out a survival strategy to create sustainable incomes for everyday living. It is a place and a time for creatively to unfold and innovation to gain a foothold. All needed in the flow for growing an economic pillar for development in a new economic era. ‘Necessity, the mother of inventions’, has always been the theme of transitions – from poverty to progress ! For it is the small things, done consistently, that will grow, and become big things. Not always, but that generally is the pattern of success – or so I am told. One such market was The Festive Market in Hillcrest, where over 168 traders displayed their wares in this year’s Christmas season. It is structures like these that give Crafters the opportunity to do good business in a six day event. I believe that this year The Festive Market was a great success, with many traders doing exceptionally well, and others, like me, covering costs with some extra to spare – a growing spurt ! My little entrepreneurial project CareSA Designs took a stand, and sold a little here and a little there, which is a small step toward success. Although sales are always welcome, it is for me the actual making of the items that give me pleasure – but that is not business, that is crafting – a form of manufacturing ! So I have to extend my range of entrepreneurship. And woven into this field is also the marketing and advertising of the products. So I designed a little price tag with a message to promote this new pillar for economic development – Love SA … buy local. Here are some pictures of the CareSA Design products at this year’s Festive Market. KZN Christmas Craft Market Festival, held in Hillcrest South Africa in December this year. Today Poverty remains the giant enemy we face in South Africa, indeed in Africa, and no matter how far we have developed politically or economically, socially we are still a long way off to “a better life for all”. Going from poverty to progress will mean changing the gears of our Thinking. Diligence – hard work, and having a good work ethic is a step in the right direction. Creativity and Innovation are reservoirs within our imaginations that can lead to progress. Faith, and Prayer for God’s guidance along the way. Perseverance, for the long journey ahead. Generosity – a signpost that points to prosperity of soul, and of finances ! Ephesians 4:28 provides a picture of the turnaround. Let him who stole steal no longer, but rather let him labour, working with his hands what is good, that he may have something to give him who has need. Entrepreneurship creates space and can contribute, in a small or a big way, to the building of an entrepreneurial pillar for economic development – especially for those not in the mainstream of society, but who find themselves in desperate poverty and under the breadline. Entrepreneurships gives vision, vision brings Hope, and Hope gives a future. 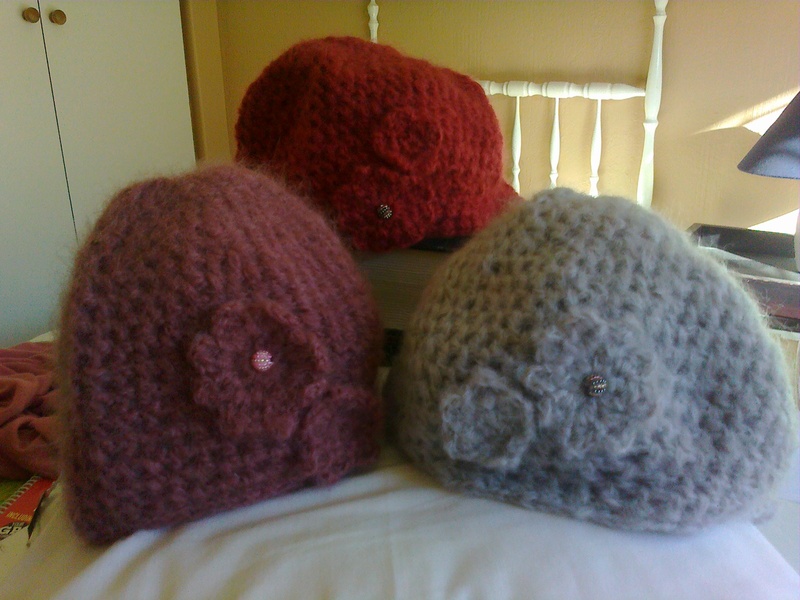 A pixel in the picture of a new South African entrepreneurial pillar is CareSA’s designs in crochet craft. Products are available at Co-Hoots, a craft shop for budding entrepreneurs. Do visit the shop in Waterfall KZN (Hillcrest area), and support these Traders in Hope – the pioneers of a new future !! Change will happen, with or without us. Circumstances can so entrench our thinking into accepting what seems to be the inevitable amid the stark demanding facts of life, that a change of mind is out of the question. But, I ask, what is the use of having a mind, if you cannot change it ? And every woman in the room will agree with me ! We can change our minds, our thinking, and so to change our worlds. Change is inevitable when embarking on a road of new discoveries. The subtle change may begin to happen when we are disgruntled with the status quo, a sure signpost on the road of change. But more often than not change will first happen on the inside of us. Then as new challenges are explored more will be revealed of what is on the inside. If we pay close attention, it will become a duel journey of self-discovery, sometimes surprising, sometimes scary ! Change brings with it a moving of boundaries, and that can be so uncomfortable. It is quite a struggle to change a mindset, especially in the field of dire poverty, whether you are poor, or are working with the poor and needy people in community. Many are stuck in the mindset of poverty, but this has to change when we develop the mindset of progress, let alone prosperity – which will require yet another mind leap. Instead of ‘poverty’ being the dominating mindset, what will happen if we should replace it with ‘potential’. In other words not look at the circumstances but at the people, and what’s in the heart of the people. That will be a rich treasure-find indeed. And then would we arrange our minds, our perspectives, our lives and our service differently ? Poverty is often invisible, until you go out and look for it. I happen to be in the “down-town” of Durban, and saw the derelict neglected condition of the buildings, the scattered refuse, and the sight of a poor humanity etching out a living for itself, amid a scene set for crime, corruption and moral decay. And yet just three blocks up was the wonderful promenade of palm trees, sunny beach umbrellas, ice cream, and happy kids. Row upon row of posh expensive hotels, that are caught up to form the bubble of excellence to impress the tourists. But lets not be harsh on Durban, every town has its “down-town” and its “up-town”. Poverty is rife, everywhere, if we look we will see it. And its a huge global condition ! What are we going to do about it ? So to change poverty to progress we are going to have to change our minds, our perspectives, our goals and our actions. The road marked Entrepreneur, such a trendy word on the lips of government, futurists and the unemployed youth, is a long steep journey out of poverty. But what does it embrace? What will it require to make the change from community development (giving to the poor) to entrepreneurial development (helping people on to self-help and own development). In the end, if progress is the goal, then what will be the result of a nation chasing only after economic development, and leaving behind the “rich” wholeness of community – even if its poor and lacking in consumables. There needs to be a plan for holistic social development alongside the national economic plan, or else all our futures will be lopsided, out of balance with inequality crime and corruption getting the prize of the century… again! If we can only keep our heads, and our values in tack. Money isn’t everything! As we progress we must keep a hold on our “ubuntu”, our humanity, our integrity, our wholeness. For as we have so vividly seen, money and power bring with it greed and corruption, which sadly is the state of our money gobbling global village as we know it today. I have found it not any easy road, as I naively begun my small entrepreneurial journey. Often I feel like just giving up. Someone once said, – ” since I’ve given up hope, I feel a whole lot better” !! It would be so much easier to just give up. Really? – but no not just yet. So CareSA Designs has produced a few new items for the 2015 season. They are pretty summer “infinities” or round scarves. 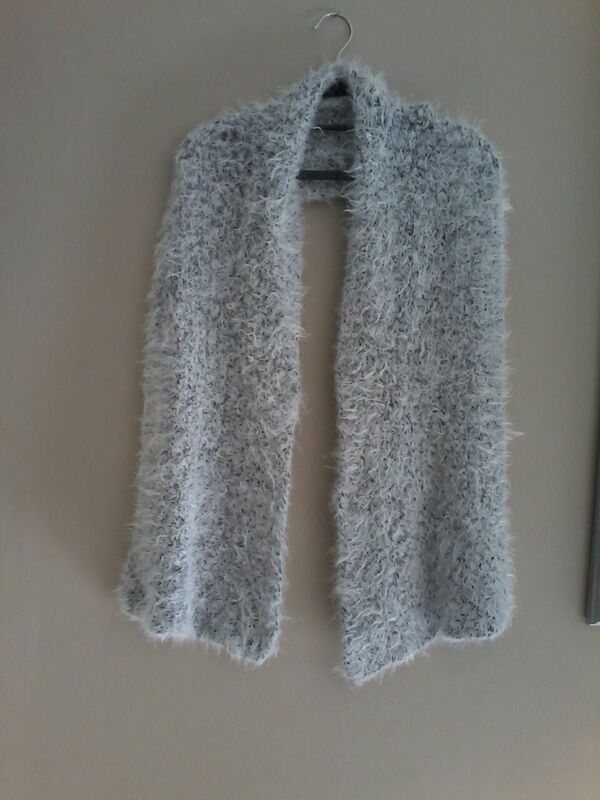 They are done in a thin cotton yarn that produces a soft gentle neckline accessory. 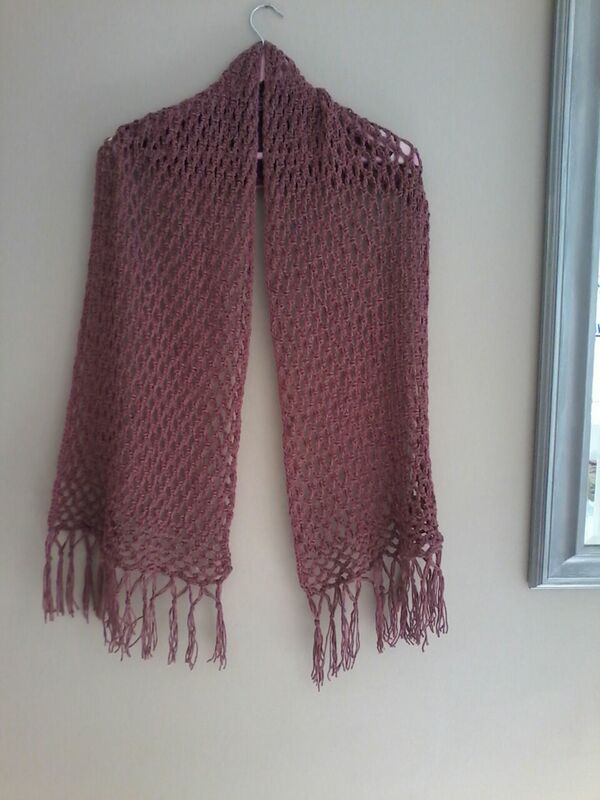 I have created new light “shoulder wraps” done in a loose stitch, that can be worn as a huge winter scarf too. 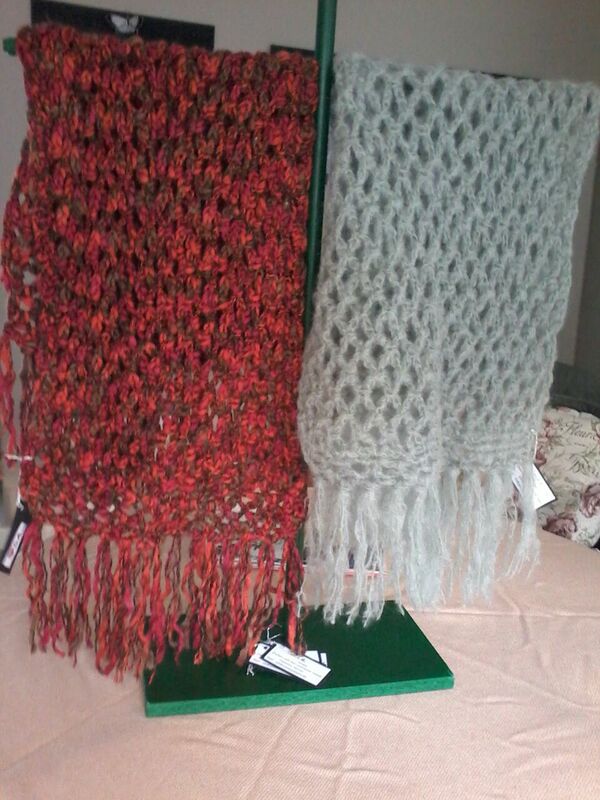 So two in one, – summer wrap or winter scarf. I have done them in textured yarns that make them snug yet light, unique and interesting. Making a debut is the Bag Range, for the young and not so young. Done in bright colours, some a shoulder sling bag, some just a handy purse. Nice for gifts. Part of the proceeds from the sales go to a fund for community service, especially those who work with the poor and needy in our society. The trend is Entrepreneurial, the theme is the potential of creativity to see if it brings us on the road to prosperity ? Since 1994 South Africa has had a new history, with a new government that had huge challenges on every level of the societal ladder viz. Moral Social Economic and Environmental. But the poor were getting poorer and the new emerging wealth-seekers were getting richer, leaving a vacuum of desperation, and of necessity – which they say is the mother of invention ! Then with the global financial downward spiral, that began in 2008/9, new innovations were being sought out to combat poverty. Entrepreneurship was beckoning as a trend in developing a new pillar in the economy of the country … and globally for that matter. CareSA Designs is a personal experimental enterprise that subscribes to the idea of a healthy work ethic through entrepreneurship that can be a means to counter poverty. God has placed within all of us gifts and talents, waiting to be discovered and to be exercised, and that can be hewn into income-generating efforts for a better life. We, as South Africans, are not to settle for poverty. We need to make a mind-shift so that we can move forward, out of poverty into progress. As crochet was a skill taught me by my grandmother I re-found this delightful craft and began to crochet and developed designs that began to bring a new dimension to me personally, and one I could use as an example of my … “from poverty to progress” slogan. This meant that I too, had to have a change of mind and develop a business brain in order to market my products. This process is still slowly being formed. Here are a few photos of some of the designs that have emerged over the last three years, creating the CareSA Designs Collection. As an organisation which have a project in skills development we were very much impressed with your beautiful designs. We would like to know if it is possible that you train our volunteers, Do you train members of the public? how long does your training takes? and how much. Oh my goodness! You do amazing work. Everytime I read your story it renews my hope in the human spirit. We are surrounded by so much death and destruction, terror and horrible intentions that sometimes my hope wanes. Your beautiful outlook on life and it’s possibilities is so refreshing. Thank you for your kind words. You are right we are surrounded by bad news that seems to dominate. But we should choose to look and see the goodness and the potential of people and situations, that requires faith, hope and love and what is more powerful than that ? Thanks for the visit, and blessings to you.